It’s not often that Guinness shows up to certify the performance of a likely top-secret project. Yet, DARPA and its partner Northrop Grumman have done just that, debuting a circuit that’s redefined the benchmark for chipset speed. Called the Terahertz Monolithic Integrated Circuit (TMIC) project, the new chipset hasn’t eked past its competition, it’s completely eviscerated it. With a peak operating speed of one terahertz, or one trillion cycles per second, the TMIC is a full 150 billion cycles faster than the next fastest circuit. Even with its inordinate increase in speed the TMIC’s most extraordinary achievement may be its simple ability to harness its own power. In most solid-state devices frequency conversion – the process of converting AC current of one wavelength to AC current of another wavelength – is employed to achieve sub-millimeter band performance. However, this current stepping has forced most of the TMIC’s contemporaries to be bulky, consume lots of power and suffer from poor transistor performance. Of course, that isn’t the case with TMIC. In fact, without having to labor through a series of wave frequency conversions the TMIC exhibits gain levels that hover around 6dB when humming away at 1THz. That fact alone has tipped researchers towards the potential of their new device. 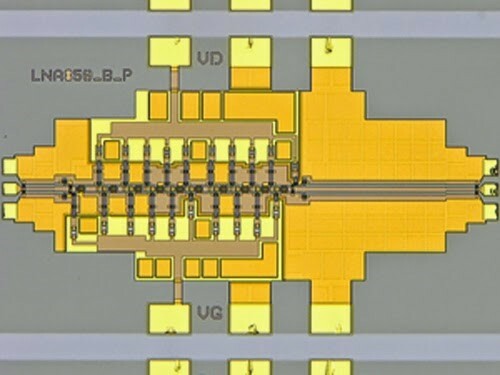 Though a few applications for the TMIC have been offered, there’s still no consensus on when Terahertz technology will make its debut in the wild.